There's a reason that rock music rarely appears in musical theatre — lest we remember Tom Cruise's performance in the Rock of Ages film adaptation. But when it's done right, it can be, well, incredible. Case in point: Belvoir's production Barbara and the Camp Dogs. 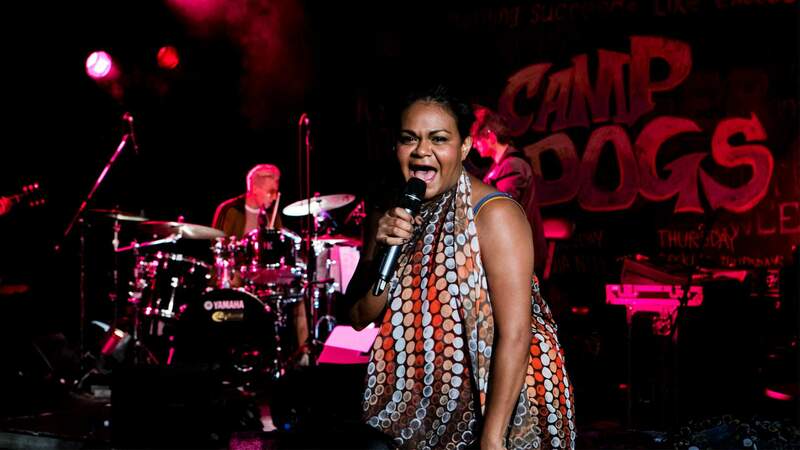 Co-written by Ursula Yovich and Alana Valentine, Barbara and the Camp Dogs tells the story of a rock band, led by wild and unpredictable singer Barbara (played by Yovich), struggling to break into Sydney's music scene. Alongside her cousin René (Elaine Crombie), Barbara returns to her hometown and is faced with a legacy of trauma and family drama. What unfolds is a confronting and hopeful story that explores the compounding hardships of being an Indigenous woman trying to make it in a relentless industry. Unsurprisingly, the show was an absolute smash hit when it first ran in 2017. So much so that, following the recent nomination for the Nick Enright Prize for Playwriting in the 2019 NSW Premier's Literary Awards, Belvoir is bringing it back for an encore season this April. Throughout the 100-minute run, you can expect emotionally charged and high energy performances from the two returning lead actors, accompanied by a live band. The band sits onstage for the play's duration and performs original rock songs, ranging from raging punk to soulful ballads, to propel the story forward. But the band members aren't the only ones that score a spot on stage. To create the vision of a quintessential Aussie pub rock venue, the stage will be filled with couches, tables and bar stools. Audience members are able to purchase tickets for on-stage seating and become completely immersed in the show. Barbara and the Camp Dogs will run Tuesdays to Sundays from Thursday, April 4 to Sunday, April 28. On-stage tickets start at $32 and standard audience tickets start at $43 for under-30s. To purchase tickets, head to Belvoir St Theatre's website.